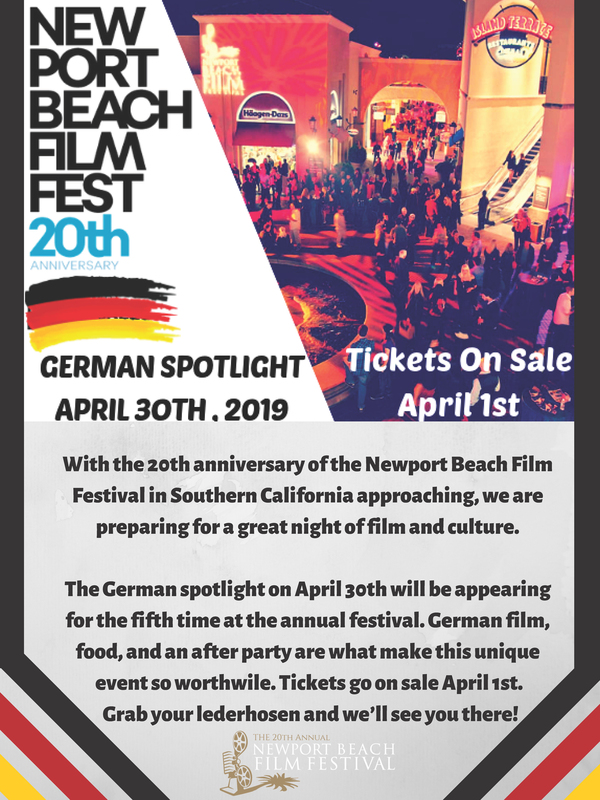 Our 5th annual German Spotlight will be on April 30th, the film will premiere at 7:30 pm once the showing has concluded all guests are invited to our V.I.P afterparty at Time Night club. Currently, our tickets are $45, which includes a film screening and the 21+ after party. The after party will include a hosted bar and catering from many of our culinary partners. From April 25th – May 2nd, 2019, the 20th annual Newport Beach Film Festival will showcase over 300 films from across the globe and host a wide array of multicultural activities. Celebrated as Orange County’s premiere film event, the Newport Beach Film Festival attracts over 55,000 attendees from around the world who come together to experience the ultimate cinematic experience along the pristine coastline of Southern California. Each year the Festival hosts nightly International Spotlight events. The German Spotlight will pay homage to the film industry and celebrate the extensive German history and culture whose influence has inspired many aspects of art across all mediums. The evening will feature a film screening, followed by a gala celebration of German film, food, and culture. We will toast the evening away with a diverse crowd of filmmakers, actors, and film aficionados.